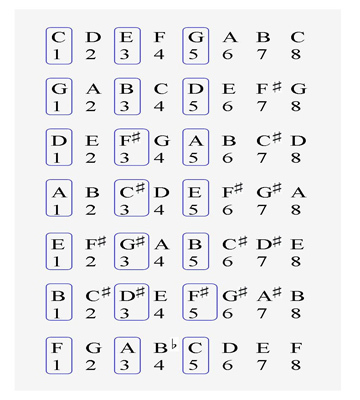 On this page you are going to learn some chord theory. The chord that is been featured is the “Major Chord”. In most cases, the first sets of chords that are introduced to beginner piano players are major chords. This is so because all the other chords such as minor, diminished and augmented are related to major chords and can be created from them. However, it is important to note that chords are used mostly for accompaniment and so they are most effective when a specific melody exist. So what are major chords? These are chords that are formed using the 1st, 3rd and 5th notes of a major scale. Here is an illustration that will help. The illustration above shows how we can form the major triad or chord for C major scale. Want to learn more about major scales? CLICK HERE!!! Major triad! ..... Yes! The word “triad” can be substituted for “chord” if only three notes are included. A triad is a group of three notes playing together at the same time. It is the popular name given to chords with only three notes. Click here to learn more about how chords work! Major triad! ..... Yes! The word “triad” can be substituted for “chord” if only three notes are included. A triad is a group of three notes playing together at the same time. It is the popular name given to chords with only three notes. Click here to learn more about how chords work! As mentioned earlier a major chord is constructed by choosing the 1st, 3rd and 5th notes of a major scale. In other words you will choose every other note in the scale starting with the first. This technique applies to all major scales. Hey! Why not give it a try? Go to your keyboard, place your right thumb on middle C and hold down every other white key using your middle finger for the second one and your little finger for the third one. Play them all at the same time. Congrats! You are playing the C major triad. There are twelve major scales in music, so this means that there are twelve major triads or chords that can be played on the piano. Here is an illustration showing how the technique of constructing major chords mentioned above applies to the different major scales. Major triads that are formed from the 1st or root of a major scale are called “tonic triads”. However, the terms 1st triad, root triad or root chord is often used. Are there any relationships among major chords? The answer is.... Yes! 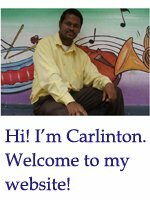 Our focus on this page so far is about root chord construction. However, there is another way in which we can form major chords and these chords are related based on the scale they are constructed from. This is an important aspect of chord theory and all young pianists should learn this concept. Here is a clear explanation. There are three major chords that can be formed from a major scale. We have explored the first one so far which is the “tonic or root triad”. But a major chord or triad can also be built from the 4th note of the scale and also the 5th note. I call the major chord that is formed starting with the fourth note of the scale the “4th triad” and the other which is been constructed starting with the fifth the “5th triad”. 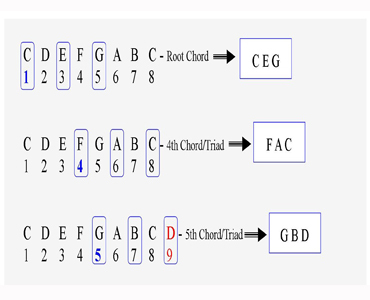 Here is an illustration showing how to form the 4th and 5th triads from a major scale. As you develop into a great piano player, it is very important that you keep this aspect of chord theory in mind. The more chords you learn, the more skillful you will become on your piano. 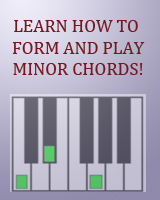 Click here to view our lesson on minor chords! Click here to leave the major chord theory page and return to home page.